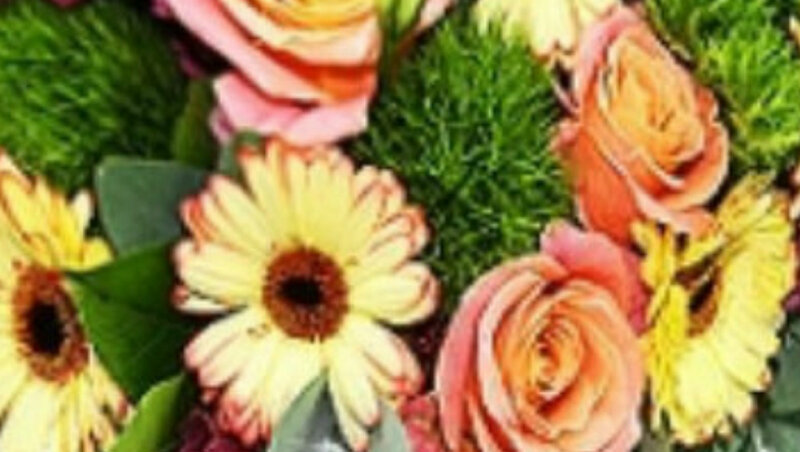 A combination of sweet peach luxury Ecuadorian roses, gerbera, purple lizianthus and French baby blue eucalyptus mixed with green dianthus (carnations). This is an absolute gem of a flower bouquet, perfect for a new baby girl, or just a baby girl at heart. For the price there is no other for me, put simply. The roses are delicious and the rest of the flowers too. I found the delivery to be timely and the experience was perfect so far. Hope you don't fail soon. I have ordered many bouquets from Flower Station, whether in passing by your famous drive-by store in Baker Street, or online. This bouquet, according to my wife, is the best so far. I do think you need a much larger option of it, as last time I bought two. I found the website pictures to be always very useful and can generally browse the website very easily.